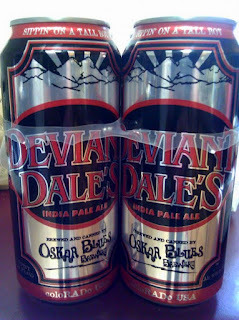 You can finally get a taste of Oskar Blues latest canned release, Deviant Dale's. Somehow, the beer made it as far away as New Jersey over a month ago but just hit our shelves yesterday. Distributing is such a convoluted process, but at least we were sent a fresh batch (canned 3/30/12). 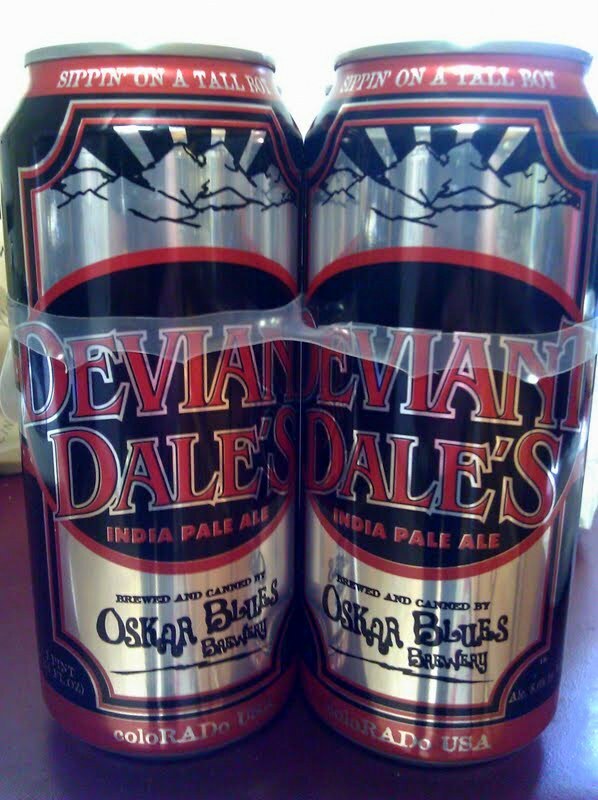 You may recall Deviant Dale's took the Silver medal winner in the IPA category (behind our own La Cumbre Elevated IPA) at the 2011 Great American Beer Fest. What struck me when that was announced was how an 8% ABV beer could be entered in the regular IPA category, as I'd think an ABV that high would qualify it as a DIPA. Either way, I've been excited to try this, though I know reviews have been mixed on it. Maybe the price factors into those reviews: $13.99 a four-pack of 16 oz. cans- and here I was the other day complaining about Torpedo's canned price. Dale's pricing makes Torpedo look like something you get at Dollar Tree. You can get Deviant Dale's at Jubilation. Awesome.14$ a Four pack, Wow. I still got to give it a try though. $3.5 per 16 oz. Not a great package liquor price, but not any worse than what any of us does on a typical night at IVB, La Cumbre, Marble, etc. 13$ in my town :D But it is quite good worth the try! not too bad a price really, as Sloppy said, and compared to Gubna as it's in a four-pack of 12s. Picked up a four pack and its delicious. Very peppery hop characteristic similar to Green Flash's Imperial IPA. A winner for sure! Now on my fav list along with Sculpin and Hop Henge. thanks for the heads up about Jubilation, Kelly's still doesn't have it and Susan's in SF (great store if you're in SF) doesn't either. Just picked up a 4 pack from Jubilation today. Can't wait to try it but I think i am gonna stop by Broken Bottle Brewery Grand Opening tonight and show some support for the locals.